The Keurig B100 is the perfect choice in coffee makers for those who wish to enjoy a fresh cup of coffee every time. Why drink coffee that has been sitting in the pot for hours when you can have a fresh cup in under a minute? Every Keurig brewer is made to satisfy the discriminating tastes of individuals who desire taste, convenience and speed in their home coffee brewing. “Keurig” comes from the Dutch word for “excellence” and that is what they strive to put into all of their coffee makers. The Keurig B100 is no exception. Since 1998, the Keurig Corporation has been making K cup portion packs for busy people around the world. Their “one-cup-at-a-time” philosophy stemmed from observing how even those people who own home brewers will often leave their home to find a fresh cup of coffee. Featuring the K cup technology, the Keurig brewers is not limited to brewing coffee. If you prefer a steaming cup of tea or hot cocoa, you will be just as happy with this Keurig coffee maker. The K cups used in these machines mean your cup of hot coffee or tea will be just the right strength without having to grind coffee beans, measure grounds or tea leaves and pour. The finest coffee and tea brands in the world supply them with 130 varieties of gourmet ingredients for K cups. Because of their pre-measured K cup packs, clean up is a breeze! The B100 will also make a fine cup of hot cocoa, though the cocoa is not available in K cups. The 64-ounce reservoir means you can make eight 7.25 ounce servings of coffee (standard size for Keurig one cup makers) without having to refill your coffee maker with water and the blue indicator light lets you know when your reservoir is empty, so you will always know when to add more water. The special timer makes it possible to set your coffee maker to make a fresh cup of coffee at a specific time – so you know that your fresh cup of coffee is waiting for you when you wake up in the morning, take a break at your office or come home after a long day of work. Once the machine has heated up, it keeps the water warm so every time you wish to make a warm, delicious beverage, you will be sure to have it in just a minute’s time. Clean up is easy, too. You do not have to worry about coffee leaks or unintentional spills on your way to the garbage can because all you have to do is throw away a pre-packaged K cup. A convenient drip tray keeps slight overfills from staining countertops. Running one cup of hot water through the maker every few days will keep your maker clean and every cup of freshly brewed beverage tasting as delicious as when your brewer was brand new. The convenience of this model of Keurig brewer is not limited to time and clean up, either. At just 15 inches tall and 8 inches wide, it fits easily onto countertops and desks without taking up much room. Its sleek black and silver color is attractive without being overly obvious. 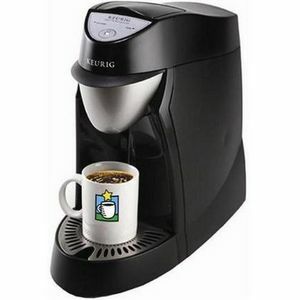 The taste and convenience of brewed coffee from the Keurig B100 coffee maker makes this model one of the most popular coffee makers made by the Keurig Corporation. This top-of-the-line machine sells for about 300 dollars. If you frequently purchase coffee outside the home, it will only take a few months to make up the price and start saving money with the Keurig B100.